Meet Deathstroke, AKA Slade Wilson, DC’s silver fox of a meta-human assassin. He’s DC’s answer to Marvel’s Bullseye – and maybe even Deathlok: an unflinching, unfailing assassin who can also mix it up hand to hand with his enhanced strength. From Deathstroke’s preview it sounded like it would be a blood’n’guts title reliving the past glories of a popular 90s character. Did I get it right? And, even if I did, is that such a bad thing? 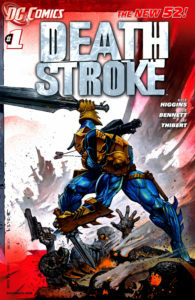 #140char Review: Deathstroke #1 manages to inject some context & intrigue into anti-hero DS for new readers. A fun brisk ish w/a minor twist. Slightly >avg. Deathstroke’s re-debut eeks out on the plus side of average, with less blood and guts than promised (not a bad thing) and a little more thought-provocation than expected. The story by Higgins takes a tact that not many of the 52 books have to this point, which is to tell a complete one-shot story in the debut issue. We travel from intro to a firm, bloody resolution in a single read, with a single plot thread dangling to carry us to the next issue. I enjoyed the heavily inked artwork. Particularly, the age and gravitas of Slade’s unmasked face is consistent and effective, as opposed to the slick lines of him in costume. It supports the idea that Deathstroke isn’t being taken as seriously as an assassin anymore. Maybe it’s more of a young man’s game. Deathstroke’s leet-speaking fanclub is annoying at first, but as the issue presses on they develop a bit of charm as his unwanted Greek chorus. Despite being rather middle-of-the-road on the whole I find myself interested enough to want to read a second issue, mostly because of the smart twist at the close that reinforces a legitimate point of mystery (even if it is stolen from Tarantino).